efficiently to maximize/increase total sales. firm's cost of production. 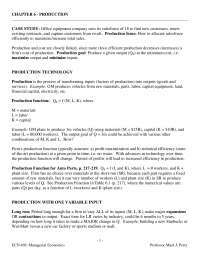 Production goal: Produce a given output (QS) at the minimum cost, i.e. maximize output and minimize inputs. combinations of M, K and L. How? the production function will change. Pursuit of profits will lead to increased efficiency in production. parts (Q) per day, as a function of L (workers) and K (plant size). Wal-Mart versus a new car factory or sports stadium or mall. contract/shrink output) makes K fixed in SR.
in TP (Q) with a one-unit change in L = MPL. efficient to have two workers per machine instead of one. TP (Total Product) is also graphed on p. 220, Figure 6.1, TP = f (L), for both 10,000 and 20,000 sq. ft.
increases. As L increase beyond 40, there are diminishing marginal returns, and MP starts to decline. Beyond 120 workers, there are negative returns to scale, as MP goes negative. Law of Diminishing Returns = MP eventually declines. production. To Max Profits, the firm wants to make optimal use of each input. How to decide? Marginal analysis, looking at the Marginal Profit from increases in the VARIABLE INPUT. 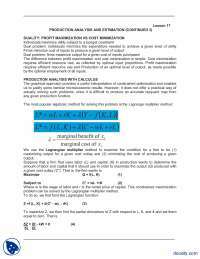 from using additional units of the variable input, VERSUS the marginal cost (MC) of the input. MC of the additional worker. 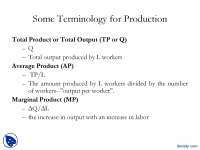 Logic: Compare MR per worker vs. the MC per worker, to MAX profits. Marginal Revenue Product (MRP) is the additional revenue (MR) from increased use of an input. worker (MP = 4.5). Firm can sell parts at $40, so MR = $40. that production in the marketplace (MR). From 30 to 40 workers: MRPL = $40 x 5 = $200. and assume that the firm can hire additional workers without bidding up the wage, so MCL = $160. eventually fall, which will eventually cause MRPL to fall. profitable, since MRPL > MCL. Going from 30 to 40 workers, MRPL = $200 > $160, so that move would be profitable. hire 40 workers to maximize profits, where Q = 230 parts per day, and plant size = 10,000 sq. ft.
What if the plant size = 30,000 sq. ft.? Optimal work force = 70 workers and Q = 520 parts per day. 4.2 = $168. From 70 to 80, MRPL = $40 x 3.2 = $128. Labor = $160/day, and the optimal L* = 70. What about 20,000 sq. ft. plant? 40,000 sq. ft.? П? Set MRPL = MCL. MPL = ΔQ / ΔL = 60 - 2L, which steadily declines as L increases, due to diminishing marginal returns. Q = 60 (26) - (26) 2 = 884 units per hour. In the long run, all inputs are variable, all plant sizes are possible, all size workforces are possible, etc. RETURNS TO SCALE helps determine the optimal size firm in the LR. Change in scale = given percentage change in all inputs, e.g. 10% increase in ALL inputs: L, K, M.
Question: How does firm's output (Q) respond to a change in scale? increasing returns and decreasing returns. face increasing costs when it expands or b) decreasing costs when it expands. take 25% more time but you would increase output by 100%. increasing returns to scale, economies of scale. POINT: When increasing returns to scale are present, the firm should attempt to expand output. and overly complex decision-making, and inefficiencies of coordinating large-scale production. Output Elasticity is a convenient, quantitative measure of Returns to Scale = %Q / %Inputs. When output elasticity is > 1, there are ________________ returns to scale. 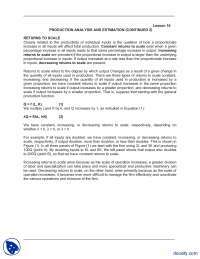 When output elasticity is < 1, there are ________________ returns to scale. When output elasticity is = 1, there are ________________ returns to scale. TC = PL * L + PK * K and the firm wants to produce Qo at the min TC. per hour, and PL = $15/hour; and MPK = 60 and PK = $40. contribution and decreasing K's contribution. = $30), for a net savings of $10 in TC, to produce the same output Qo. productive input, what will happen to its MP? K = 8 and L = 10, which satisfies the MIN COST condition. optimal outcome is K = 18 and L = 20, to produce 886 units at a min cost of $470. 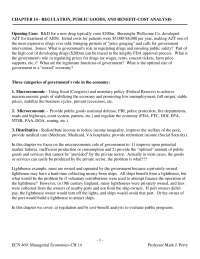 certain ranges of inputs, but is NOT consistent with the Law of Diminishing Marginal Productivity. declines will it be optimal to use BOTH inputs. Conclusions: 1. Constant MP = exclusive use of one input to minimize cost, which is an extreme case. 2. Declining MP = combination of inputs to minimize cost. and more than one driver can't drive one taxi. the skill level required for operation. cannot shift towards more intensive use of capital to save money. equipment make L more productive. 3. As L (or K) increases, MPL (or MPK) decreases, reflecting diminishing marginal returns. 4. Returns to scale depend on the sum of the exponents. a. Constant returns to scale when a + b = 1.
b. Increasing returns to scale when a + b > 1.
c. Decreasing returns to scale when a + b < 1. 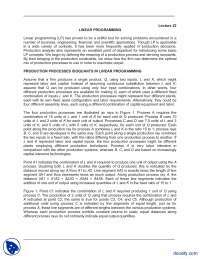 Proof: Assume L = K = 2, then L = K = 3, a 50% increase in inputs, what happens to output (%Q)? .6 = 3.74, a 62% increase in output Q, from a 50% increase in inputs K and L.
.5 = 3.00, a 50% increase in Q, from a 50% increase in inputs. .4 = 2.41, a 37.9% increase in Q, from a 50% increase in inputs. Log (Q) = Log (c) + a Log (L) + b Log (K), we can convert all variables to logs and run OLS. what about a new product? 1. 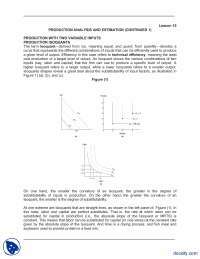 For a fixed plant size (K), what is the effect on output (Q) of increasing L, e.g., adding extra shifts? 3. 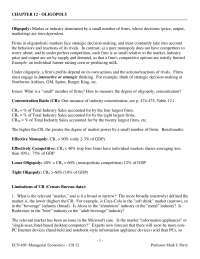 For a fixed labor supply (e.g., union contract), what is the effect of adding/investing in K? 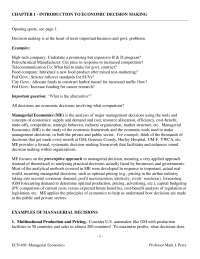 managerial economics, estimating production functions using operations research and OLS. coal (tons) per mine, amount of labor (hours) per mine, and amount of capital equipment ($) per mine. 1. Optimal use of a singe input: MAX profits by increasing use of L until the MRPL = MCL. See Figure 6.4 on page 241. Which plant is more productive overall? Why? Suppose we start by allocating 50/50, using 5,000 bbls. at each plant, with Q = 182,500. TOTAL Q = 182.50 or 182,500 bbls. therefore that they should shift more oil to Plant A and less to Plant B, until MPA = MPB. 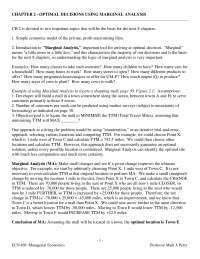 MB = 2 and MA = 8.
that point MPA = 14 and MPB = 20, so some production should be shifted from Plant A to Plant B.
different products, assignment, accounts, etc.? MIN Inputs, or Maximize productive efficiency, or economize on the use of scarce resources, etc. MG + MF = 20,000 bbls. 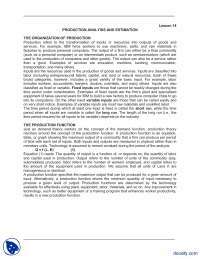 of crude oil, used for either Gasoline (G) or Fiber (F). F = thousands of square feet of fiber. solve for MG and MF. MG = 8 and MF = 12. Total П = $744,000 (minus cost of crude oil). and only 40% to G.
Page 242, Check Station 5: What if profit per sq. ft. for fiber (F) falls to $.375 per foot? still be equalized across plants or products, i.e. MPA = MPB = MPC, etc. or MПA = MПB = MПC , etc. Revenue Product) equals its MC per unit (input price), i.e. MRPA = PA, etc. See: Allocating a Sales Force, Revisited, p. 243-244.